The temple to Hanuman, the "monkey god" and servant of Lord Ram, is built around a tree. Within the tiny temple is the tree and an image of Hanuman. Worship is done here every evening and on festival days. "Just a little distance from this temple there was an open space full of bushes and thorns. Seeing a very big tamarind tree I sat under the shade with a heavy heart. The Mother focused within my mind all about Her desire to stay in that speck of land, where for the whole day I had retreated and taken shelter out of fear. Soon the veil of my sorrow got nipped. I was retrieved back to an honourable state by a new set of people. The owner of that stray land was diffident to express his mind to me straightaway. Nevertheless, I was given a candid assurance that I might acquire that barren land covered with bushes and thorny plants and convert that into a habitable corner. As proposed, the next day following a few labourers were engaged by the owner to lop off the creepers and other plants to the level of the ground. 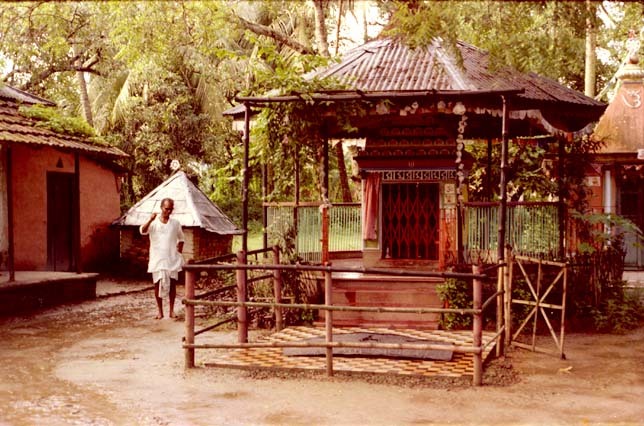 At the quickest possible time the outlook of the dreadful land got the resemblance of a small Ashrama (hermitage)."